Take back control of your life with this revolutionary new approach to self-understanding, self-healing and self-improvement. All feelings are good! Even anger, sadness, guilt, and depression...This book reveals the healthy side of emotion that leads to success and personal fulfillment. How to stop feeling bad for feeling "bad" and start feeling better now! Click on the pages below to enlarge. Links open in a new window. In this book, Calvin Banyan, will reveal how thousands of hypnosis sessions have uncovered a secret language inside of each of us and how our lack of this understanding has caused every kind of addiction, compulsion and bad habit.It will show you how--through the understanding of this hidden language, that you can begin to set yourself free right now and become more successful than you have ever imagined! This book announces, "All feelings are good!" Anger is good, sadness is good, loneliness is good, even frustration and depression are good, once you understand the message contained within each and every one. Those messages are revealed in this book along with how to respond to the important information, giving you new direction in your life. This direction will lead you to happiness, success and more. 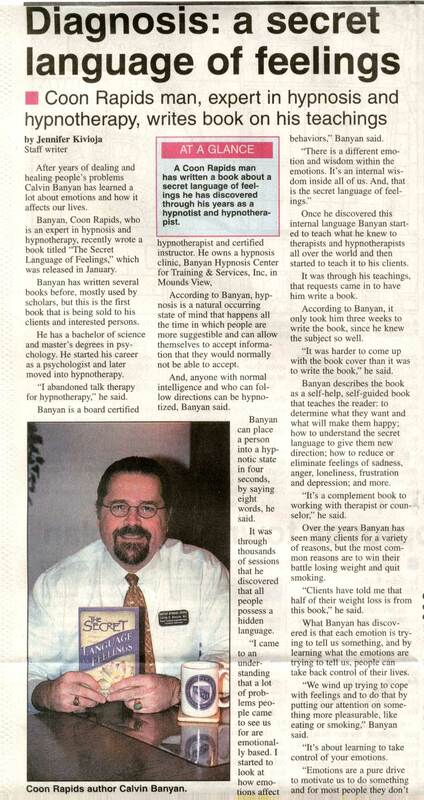 Check out a review for The Secret Language of Feelings by Judy Mcbride of "Your Health Magazine"